When the truth hurts, it’s easier to ignore it or try to apportion blame. This un-emotionally-intelligent response could prevent us from moving forward. There’s some irony when we’re talking about a reaction to emotional intelligence data… even if it says Europe has the lowest EQ of all the world regions. Maybe there’s insight we need to hear. Looking around, it’s all too easy to see the “EQ challenges” — yet this moment is also abundant with opportunity. As described in the beautiful EQEU eBook, this region has great diversity, increasingly complex challenges and an uncertain future — all of which demand we grow and use our emotional intelligence. How best to do so? We can use the State of the Heart data to confront those challenges, embrace change, and create a more sustainable future. New research from largest-ever study on emotional intelligence shows scores in Europe are lower than any other global region. What’s the implication? How about you? What thoughts and feelings arise when you read the European region’s State of the Heart report? 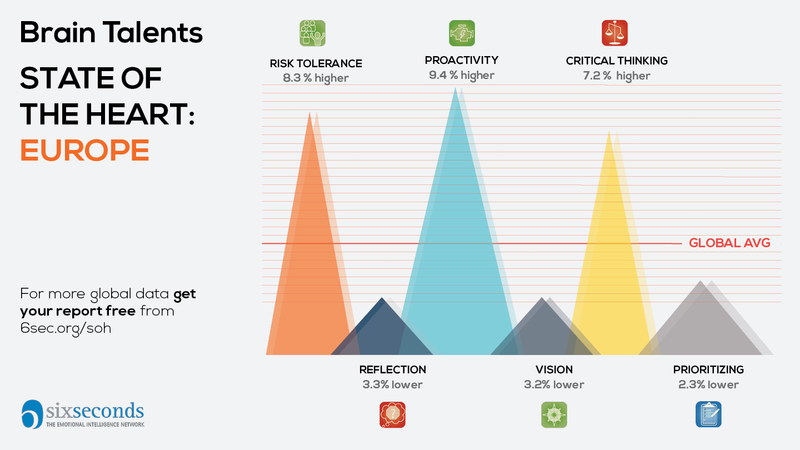 In addition to overall trends in emotional intelligence across world regions, the State of the Heart Report provides insight on eight archetypal “Brain Styles.” These are learned approaches to how emotional intelligence is being used to get data, make decisions, and fuel action. Energizer brains tend toward emotional data, innovative decisions, and practical action. Deliverer brains prefer rational data, innovative decisions, and practical action. Is there a theme emerging? Perhaps we want to find new options and do something NOW. Strategist, who tend toward rational data, evaluative decisions and idealistic drive. Sage, a style characterized by emotional data, evaluative decisions and idealistic drive. Two out of three are opposite of the strengths in Europe. The risk here is that ‘innovative’ decisions can ignore careful consideration… and ‘practical action’ can mean short term gain rather than long term plan. So while the dominant brain style is very positive in terms of action, it could be we’re leaning toward “let’s do something new, now” without considering the risks and long-term value. New data on emotional intelligence in Europe shows a tendency toward innovation and action – which is valuable. And, what happens if there is not enough careful reflection plus long-term planning? The evidence is growing that EQ skills are ‘at the heart’ of building people to be good with people. As the World Economic Forum found, these people-skills are the most important for our future. With the rise of AI and the 4th Industrial Revolution, growing EQ is an urgent need for us in Europe. These are the skills that will fuel innovation PLUS human connection (instead of people vs machines). Best of all: We know that EQ can be learned. Another powerful “lens” offered by the State of the Heart is analysis of eighteen practical actions for actually USING emotional intelligence in day-to-day work and life. 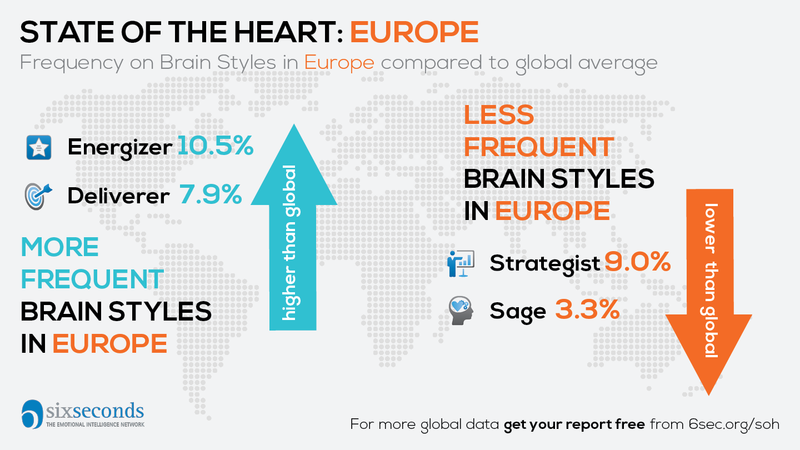 Compared to the global average, the European top talent is Proactivity — which makes sense given the Brain Styles described above. Risk Tolerance is about capacity to handle complexity, which is ideal for the rising stressors. Critical Thinking enables us to assess, adapt then apply insight to find a long term solution. Unfortunately, Reflection is lowest in the Europe region, which explains the ‘do it now’ orientation but may mean that clarity of a challenge is reduced as we haven’t paused to step back and evaluate. I feel optimistic that our top talents will serve us well to take action. We just need to remember to pause and look before we leap. Paying attention to balance; using data to inform decisions and understanding the consequences of my action or inaction is something I take away from this report. How about for you? Growing the network of emotional intelligence practitioners in the UK and beyond. Katharine's background spans business, education and government, bringing a practical and fun approach to build the capacities people most need for a healthy future.